Is the ‘lost city of Apollo’ in Wiltshire? 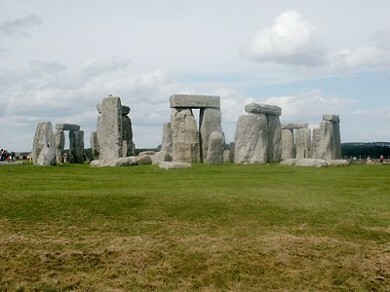 On 24 August 2007, This is Wiltshire ran a story claiming that a ‘lost’ Neolithic city has been found near Stonehenge. If true, this would be one of the most important discoveries ever made in England. The claims are made by Dennis Price, described by the newspaper as a ‘renowned archaeologist… an expert on the history of Stonehenge and who used to work with Wessex Archaeology’, so we have no need to worry, do we? Stonehenge: the ‘noteworthy ball-like shrine’ of Diodoros? The ‘noteworthy shrine’ has often been identified with Stonehenge, its ‘ball-like’ shape explained as a reference to its circularity. While this is possible, it is by no means certain that the land of the Far-Northerners is Britain, which Diodoros describes elsewhere (V.21) without mentioning the Far-Northerners. Although Diodoros says that it is in the ocean by Gaul and is as big as Sicily, there are aspects of its description that do not really fit. The citizens are said to be mostly harp players who received Greek travellers in the past, who left inscriptions behind. The moon is apparently larger in their country, as it is said to appear closer to the earth. The climate is so good that it is possible to raise two crops in a year. This does not sound like the Britain we know! Nevertheless, the idea that the temple can be identified with Stonehenge is accepted by many archaeologists. What is curious is that Diodoros is not writing about the distant past, when Stonehenge was used, but about the present (or at least, the time of Hekataios (Hecataeus), whom he cites as an authority for the Far-Northerners, c550-476 BCE); this is a long time after the third millennium BCE, the period of its construction. Even its use cannot be demonstrated for a thousand years or so before Hekataios was writing. Another issue is whether or not we can accept that there were ‘towns’ in Britain either in the fifth century BCE or during the period of Stonehenge. Most archaeologists would either say not or would worry about definitions: can we call nucleated settlements in Early Iron Age hillforts towns and can we call places like Durrington Walls towns? Should we accept that Diodoros (or Hekataios) had no equivalent term in Greek for these types of settlements and simply used the closest available word? The claims seem very overblown and it is certainly a big stretch to suggest that Vespasian’s Camp can be identified with the site. It’s worth noting that Diodoros does not claim that the ‘noteworthy shrine’ and the ‘town’ are close together, merely that they are in the same island. Fortunately, Dennis Price is a prolific blogger who has written up the results of his research in a more extensive format than is possible in a short newspaper piece. Okay, it’s not from a peer-reviewed journal and it doesn’t have the academic paraphernalia of references, but he does quote authorities and even gives Diodoros’s original Greek so that we can check the reference for ourselves. He gives only the section quoted above and does not give full references about where the passage can be found in Diodoros, so most visitors to his site, I suspect, will not follow it up. He cites Pytheas of Massalia as the source of information about Britian, which is true for the description in Book V Chapter 21, but that is not where the description of the ‘ball-like’ temple is found: getting a basic fact like this wrong does not make us confident about Dennis Price’s other assertions. Dennis Price has undertaken no fieldwork to reach his conclusion, which has been launched straight at the local press, a typical technique of pseudoscience. He is keen to follow in the footsteps of Schliemann, like many Bad Archaeologists, in the hope that his reading of classical texts will lead him to important discoveries. The best evidence he can find to back up his assertion seems to derive from a description of Vespasian’s camp taken from English Heritage’s website. The presence of a Bronze Age burial makes it very unlikely that this was the site of a major population centre during the Age of Stonehenge: burials were kept distant from habitation. This is a disappointingly lazy bit of deconstruction. The last two paragraphs are either ad hominem or attacks on pedantic points of academic style (getting a reference wrong means one can dismiss the central thesis). The only bit of actual arguement comes in the last sentence. This isn’t ad hominem at all: I looked at the sources of evidence used by Dennis Price (textual and archaeological) and found his use of them wanting. I wrote “either ad hominem or attacks on pedantic points of academic style”. That’s an “either…or”! As for the pedantic points of style: do I really have to say that just because someone gets one citation wrong doesn’t mean their argument is wrong? None of those points are actually a counterargument, they are attacks on the presentation and the author (the latter being the definition of ad hominem). No, I’m pointing out that he’s not gone through any process of peer review. Such a process would have ironed out the issue with the incorrectly cited reference; it’s not a “pedantic point of academic style” to get things right. The point is, there is no evidence to back up his claims. He cites a text that may not refer to Britain at all; the text mentions a &lduo;ball like” shrine that doesn’t sound like Stonehenge; the date is wrong, as Stonehenge had not been used for a millennium before the time that Diodoros’s source was writing. If you want an ad hominem, look at Dennis Price’s attack on James and myself on his blog (he may have removed it, of course, as I suggested to him that it was bordering on libellous: I have no stomach to go back and check). I agree. I just wasn’t happy with the explanation. From the first couple paragraphs I was looking forward to a detailed background and explanation of the “ball shrine” – like more info. on the current state of academic knowledge regarding this. So I was disappointed because it felt like the piece was cut short, and I wasn’t satisfied with critiques of his critical apparatus. I’m not familiar with any of Dennis Price’s blog. I don’t want to get in an argument, so we should just end it here. I should add that I’m a fan of your site in general. Now that I read again my above comment, it seems too rough. Sorry about that. I don’t see a mention of a “ball-like shrine” in the text you quote. Instead, it seems to refer to “many offerings, ball-like in shape” that were at the shrine. Is there some obscure point of ancient Greek grammar that means “ball-like” has to refer to the shrine instead of the offerings? Grammatically, ναὸν (‘shrine’) is singular masculine accusative in form, as is σφαιροειδῆ (‘ball-like’). This suggests that σφαιροειδῆ refers back to ναὸν. I hope this helps. I think you’re looking in the wrong country. A couple of moments idly browsing Dennis Price’s blog and I stumbled upon his description of Geoffrey of Monmouth’s ‘Startlingly accurate’ account of the creation of Stonehenge. As a medievalist and a historian of the 12th century chroniclers this was enough for me.